Abstract. 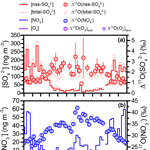 Triple oxygen isotopic compositions (Δ17O  = δ17O − 0.52  ×  δ18O) of atmospheric sulfate (SO42−) and nitrate (NO3−) in the atmosphere reflect the relative contribution of oxidation pathways involved in their formation processes, which potentially provides information to reveal missing reactions in atmospheric chemistry models. However, there remain many theoretical assumptions for the controlling factors of Δ17O(SO42−) and Δ17O(NO3−) values in those model estimations. To test one of those assumption that Δ17O values of ozone (O3) have a flat value and do not influence the seasonality of Δ17O(SO42−) and Δ17O(NO3−) values, we performed the first simultaneous measurement of Δ17O values of atmospheric sulfate, nitrate, and ozone collected at Dumont d'Urville (DDU) Station (66°40′ S, 140°01′ E) throughout 2011. Δ17O values of sulfate and nitrate exhibited seasonal variation characterized by minima in the austral summer and maxima in winter, within the ranges of 0.9–3.4 and 23.0–41.9 ‰, respectively. In contrast, Δ17O values of ozone showed no significant seasonal variation, with values of 26 ± 1 ‰ throughout the year. These contrasting seasonal trends suggest that seasonality in Δ17O(SO42−) and Δ17O(NO3−) values is not the result of changes in Δ17O(O3), but of the changes in oxidation chemistry. The trends with summer minima and winter maxima for Δ17O(SO42−) and Δ17O(NO3−) values are caused by sunlight-driven changes in the relative contribution of O3 oxidation to the oxidation by HOx, ROx, and H2O2. In addition to that general trend, by comparing Δ17O(SO42−) and Δ17O(NO3−) values to ozone mixing ratios, we found that Δ17O(SO42−) values observed in spring (September to November) were lower than in fall (March to May), while there was no significant spring and fall difference in Δ17O(NO3−) values. The relatively lower sensitivity of Δ17O(SO42−) values to the ozone mixing ratio in spring compared to fall is possibly explained by (i) the increased contribution of SO2 oxidations by OH and H2O2 caused by NOx emission from snowpack and/or (ii) SO2 oxidation by hypohalous acids (HOX  =  HOCl + HOBr) in the aqueous phase. How to cite: Ishino, S., Hattori, S., Savarino, J., Jourdain, B., Preunkert, S., Legrand, M., Caillon, N., Barbero, A., Kuribayashi, K., and Yoshida, N.: Seasonal variations of triple oxygen isotopic compositions of atmospheric sulfate, nitrate, and ozone at Dumont d'Urville, coastal Antarctica, Atmos. Chem. Phys., 17, 3713-3727, https://doi.org/10.5194/acp-17-3713-2017, 2017. We show the first simultaneous observations of triple oxygen isotopic compositions of atmospheric sulfate, nitrate, and ozone at Dumont d'Urville, coastal Antarctica. 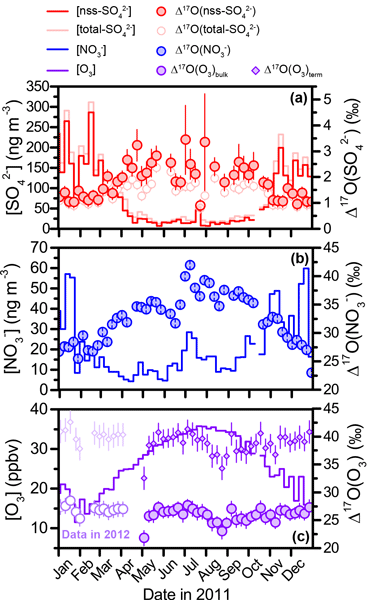 The contrasting seasonal trends between oxygen isotopes of ozone and those of sulfate and nitrate indicate that these signatures in sulfate and nitrate are mainly controlled by changes in oxidation chemistry. We also discuss the specific oxidation chemistry induced by the unique phenomena at the site.